It is always a pleasure to welcome a representative of a new plant family to The Wednesday Weed. 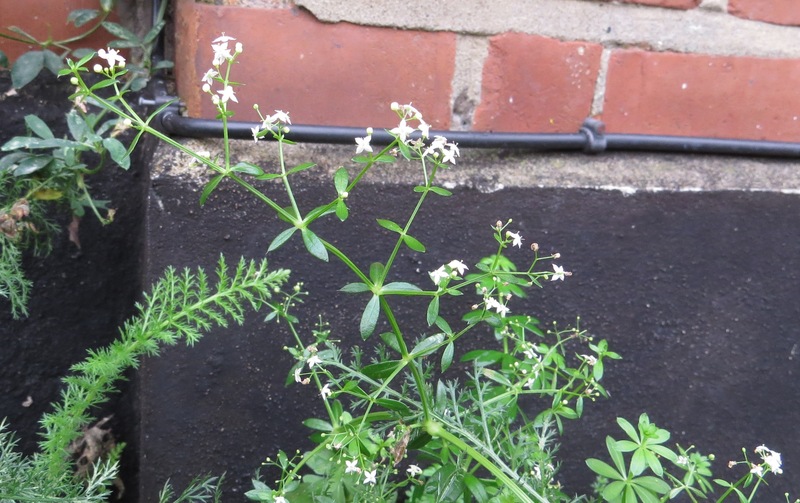 This week’s star is Cleavers, also known to me as Goosegrass and, when I lived in Dundee, as Sticky Willie. I found it growing in a neglected but fruitful flower bed at the top of Park Hall Road, and was delighted to find that it was in flower in the middle of November. 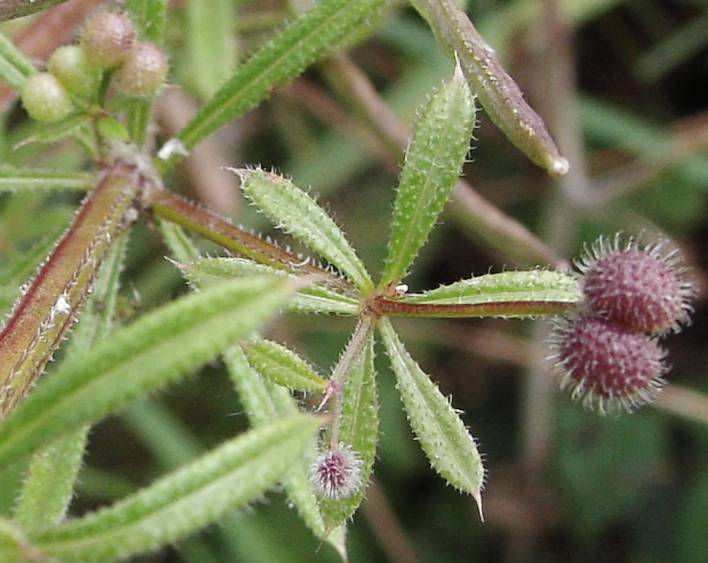 Cleavers is a member of the Bedstraw family, which includes a host of small-flowered scrambling plants. 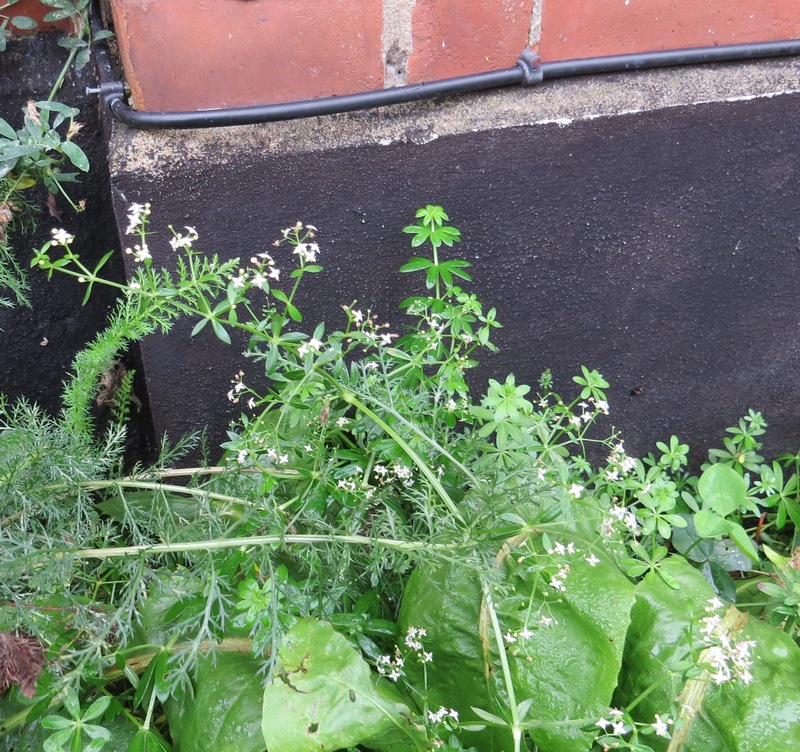 The name comes from the medieval use of the plants as bedding material, and Cleavers was used as part of the mixture because the tiny hooks that cover the plant held the contents together, ensuring that the ‘mattress’ thus created didn’t become too lumpy and bumpy. As a child, I remember that I delighted in attaching this plant to my long-suffering brother when he wasn’t looking. The sticking-power of this plant is very satisfying, especially if the victim is wearing a woolly jumper or a duffle coat. Indeed, I would sometimes manage to cover my sibling in so much Cleavers that from the back it looked as if Birnam Wood was once again on its way to Dunsinane. Forty-five years later, I am still waiting for the retribution that will surely come my way for such silliness. Cleavers is a plant of many, many uses. When I was in Scotland, we would gather armfuls of Goosegrass to feed to the ducks, geese and chicken that we raised on a city farm. And in Plants Britannica, Richard Mabey describes how a combination of nettles and Herriff (yet another name for Cleavers) was used to make a beverage that resembled ginger beer. Mabey also relates how the fruits of Cleavers were used by the lacemakers of Bedfordshire to cover the pinheads on their lacemaking cushions. 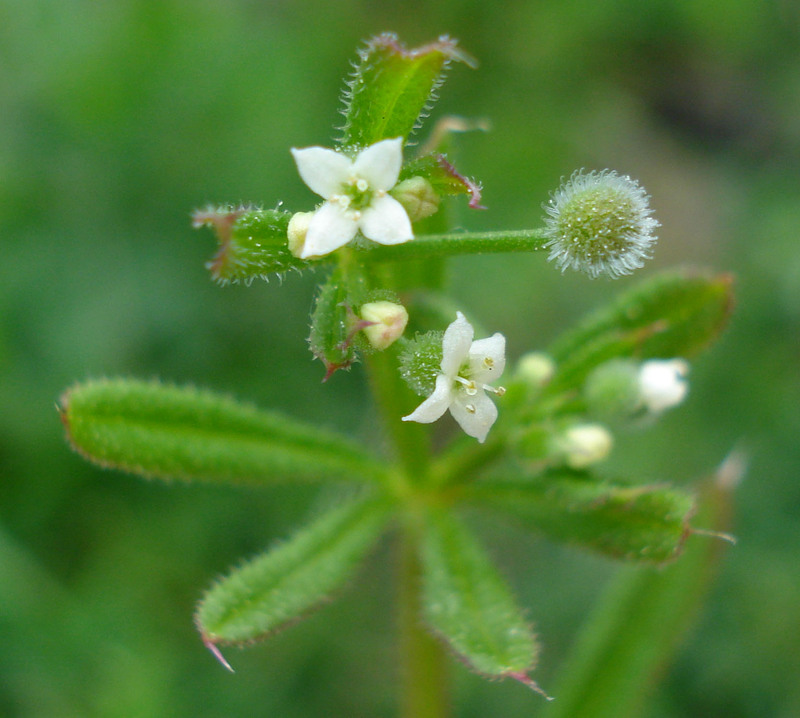 In spite of its hairiness, Cleavers is said to be edible if cooked before the flowers appear. But even more astonishing is the fact that Cleavers is in the same family (Rubiaceae) as the coffee plant, and the fruits can be used as a coffee substitute, though I suspect that one would need an awful lot to knock up an espresso. 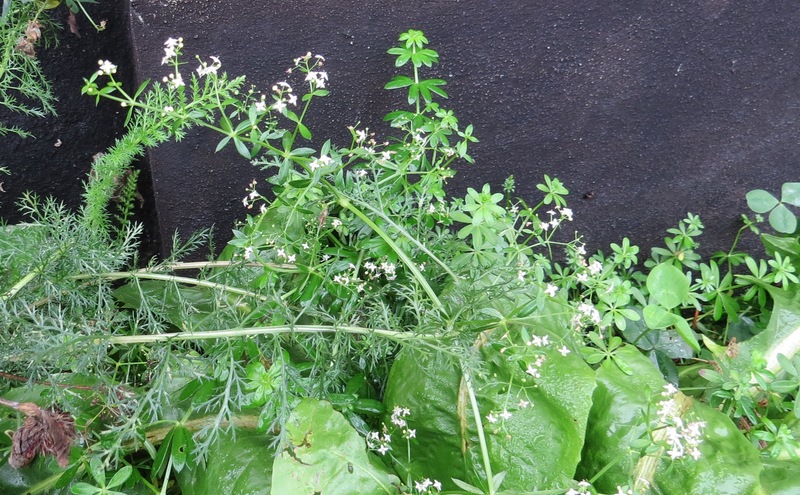 Cleavers has been used for a host of medicinal uses: it has been a lymphatic tonic, a poultice for leg ulcers and a mild sedative. Its hairy stems have been used as a sieve for milk into recent times in Sweden. And its roots can be used to produce a red dye – according to the Plant Lives website, when birds eat the root of Cleavers, their bones are turned red. I have been amazed by the sheer variety of ways that this modest little ‘weed’ has been used. Today, I wonder if city children even know that they can use it to torment their brothers and sisters. We are becoming more and more detached from the world around us, but it doesn’t have to be that way. The plants are still here, just waiting to be noticed. 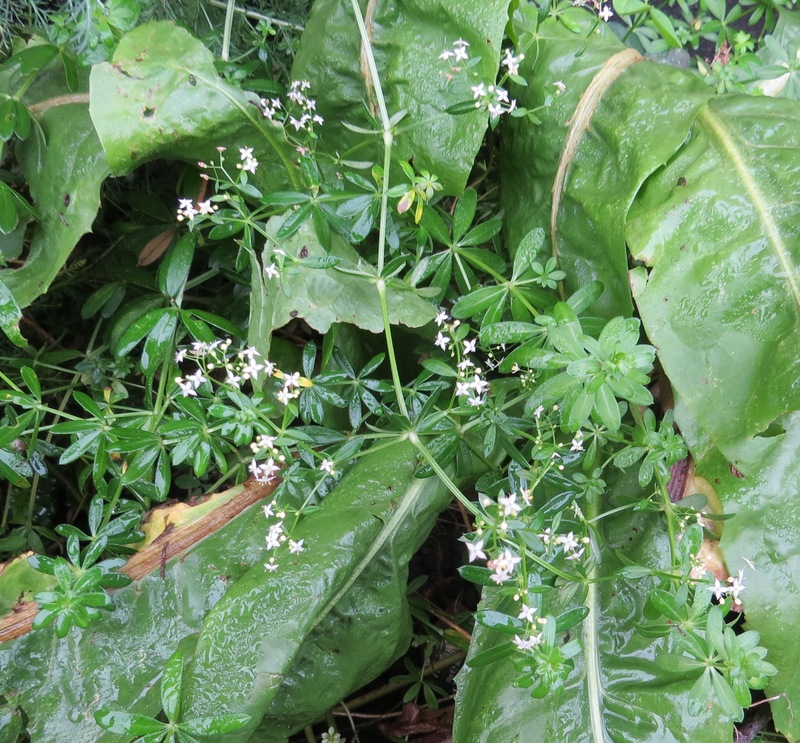 This entry was posted in London Plants on November 19, 2014 by Bug Woman. What a fun memory this little weed produced for you! What an amazing little plant. I am sad that children today don’t get outside as much and have so many distractions they miss the world of the wee weeds. I grew up quite poor and being outside meant I wasn’t around to have to do chores. I loved creating little villages for the fairies and such! Hi Laurin, I spent hours playing in our tiny garden as a child, putting my toy animals amongst the dahlias and runner beans and watching the insects. It’s a shame that so much of a child’s time is structured as a ‘learning experience’ these days, rather than letting them find things out for themselves…. Thank you Rebekah, glad you’re enjoying the blog….